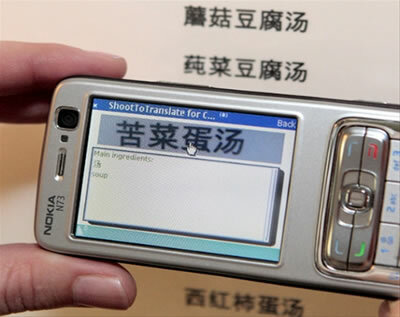 Nokia has just showcased a nifty mobile translator cameraphone application called Shoot-to-Translate. The intent is to ease the lives of busy travelers trying to read signs and news in foreign lands. You see a sign or other text in Chinese, take a clear picture, and (Bob's your uncle) you've got the English version. At present, the Nokia Shoot-to-Translate feature only translates Chinese to English. I believe that there is a close analog to this device provided as an assistive device to people who are visually impaired. The K-NFB device developed by Ray Kurzweil would allow the user to take a picture of some text in English, do character recognition, and then read the resulting text aloud. See K-NFB Portable Text To Speech for more details. Go back and forth between most permutations of English, French, Italian, Spanish, German and Portuguese. This system can capture and translate the text and numbers of up to 3,000 license plates per hour. Via Nokia Mobile App Translates Text.